The #RugbyUnited project describes itself as "a digital communications organisation that brings rugby together on social media. Through twitter, we bring together over 500,000 users who follow our rugbyunited accounts. These accounts represent 150 nations and professional rugby clubs, who unite to provide the worlds largest network of rugby fans." 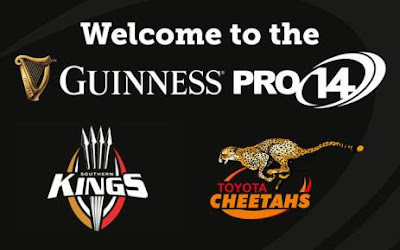 We reached out to the curators of #rugbyunited accounts representing the two South African teams that have just joined the newly-rebranded Guinness Pro14, asking them some questions about their thoughts on the new arrangement. Can you tell us a bit about yourself, how you are a Cheetahs/Kings fan and how did you get involved with #rugbyunited? My name is Johan du Plessis and I was born and bred in the Free State Province and was privileged to accompany my late father to many games in Bloemfontein to support Free State since the early 1970's. Since then I have attended hundreds of games in the Free State Stadium (now Toyota Stadium) and was present when we first won the Currie Cup in 1976 as well as the other 4 times in history that we won the oldest domestic Rugby Union Trophy in the world 2005, 2006, 2007 & 2016. I started to follow Rugbyunited a few years ago and when the request came to run the @RugbyCheetahs account I replied and was fortunate to be accepted. My name is Craig Walters and I live in Wales. I became a part of Rugby United when Dan from @Rugby_Global sent me a DM in May 2016 asking if I would be interested in taking over an account after he could see my passion and love for rugby through my tweets. I was a big fan of PRO Rugby in USA and I was given @rugbydenver. When that league folded I took over @RugbyBaaBaas and a month ago had the opportunity to take over @rugbyskings1. I became took notice of Southern Kings during the 2009 British and Irish Lions tour when the tourists played a midweek game. Being a big follower of rugby I was a fan of what South Africa were doing with the promotion relegation to Super Rugby and in 2013 I became a fan of Southern Kings because I always support the underdogs. When they returned to Super Rugby in 2016, after 2 seasons out, I was happy to see them return and that’s when I became a bigger supporter (again, because I love an underdog). How did you feel about the Super Rugby as a competition going into the 2017 campaign? It was always a great experience to be part of the Super Rugby competition and to compete against the New Zealand & Australian teams but since it became Super18 with all the different conferences the competition's has lost some of its appeal. Especially the fact that we only play New Zealand & Australian teams alternatively every second year changed the whole experience and atmosphere. The format also resulted in a bit of unfairness regarding qualifying for the playoffs as per your position on the overall log. Going into the 2017 competition we expected and accepted that changes have to be made and always knew that part of that would be to reduce the number of teams. We were also quite aware that, should a reduction in teams occur, the Cheetahs would likely be one of the South African franchises that would need to consider alternatives. I must admit after the 2016 season of Super Rugby I looked back and thought that the competition was a little clustered. When teams don’t play every other team in the competition and yet they are all in the same table it kind of devalues it a little. For example, the Lions got home Quarter-Finals and Semi-Finals and Final this year because they finished top but only played 3 out of the top 8 teams in the final standings. In the 2016 season the only complaint people had were about 3 teams having more points than the Brumbies yet had to go away in the Quarter-Final and Brumbies get a home game but there was always that feeling that of an unfair format which this season is a fine example. But I also felt hypocritical because without the format we may not even have a team in Super Rugby. What was your impression, if any, of the Pro12 before you knew your team was likely to be joining it? As a passionate rugby supporter (and Superbru fan) I have always followed the European competitions with great interest. The fact that so many South African players, including some of our Cheetah guys, are playing in the Pro12 has served to generate interest in this competition and its teams from South African rugby fans. Rugby competitions in SA are typically not played on Sundays nor the in December/January period and therefore Pro12 gained a lot of followers here who are thankful that there is rugby to watch on the telly on those days instead of boring soccer, golf etc. Pro12 and the other European competitions also keep us up to date on the standard of rugby and quality of players that the Springboks will have to face when we are playing our Northern Hemisphere counterparts. Living in Wales and being a Cardiff Blues fan in the Pro12 I know what the league is about and honestly I am excited. The Pro12 is growing year on year but the money from tv isn’t that big. The French Top 14 receives about £74 million, Aviva brings in £49 million and the Pro12 would only bring in about £11-12 million (now gone up to 17 million). In terms of TV in Wales there are at least 2 games on every weekend from the Pro12 plus whatever games Sky Sports show so it is pretty exposed. In terms of the quality there are some fantastic teams like Leinster, Munster, Glasgow and Scarlets. The Christmas derbies are always my personal highlight. The Welsh regions get excited and are great to watch but for me the Leinster v Munster games are the best, especially when they play in the Aviva Stadium. Tell us about what your team will bring to the Pro14? A particular style of rugby, certain individual talent, something else? I can assure you that the Cheetahs will make a strong contribution to the Pro14 Competition due to our brand of rugby and players that we are producing. Our Cheetah team is well known and recognised for our exciting style of running rugby and has, as a result, won the support and admiration of thousands of rugby fans all over the world. In SA it is a well known fact that most of the other franchises supporters will tell you that the Cheetahs is there 2nd favourite team. Soon there will be a lot of rugby lovers in Europe that will share this view. We are the current Currie Cup Champions and most of the players that won this prestigious trophy for us last year will be in action in the Pro14. We last lost a Currie Cup game in the 2015 semifinal against the Lions at Ellis Park and are again currently top of the log, being the only unbeaten team. Apart from our stars that won the Currie Cup in 2016 we have now contracted 3 of the current 7's World Champ Blitzbokke; Cecil Africa, Rosco Speckman & Chris Dry, that will all be in action in the Pro14. One thing that players will love but at the same time will hate is the weather. On one hand it will be open to some great running rugby like the Scarlets last year. On the other hand their lungs will certainly feel like exploding, they certainly won’t be use to playing in the South African summer weather. Our hottest months are January and February where the average temperature is around 25c (70f) and the record highest is 40.7c (about 105f) so bring plenty of water. A bit about the team, our captain is Loose-head prop Schalk Ferreira who has experience playing for Toulouse and he played against Pro12 opposition in European competition. A player I am excited about and I have seen a lot of people agree with me, is Yaw Penxe, he has scored 2 tries in 5 appearances for the Kings so far and was in the South Africa U20 squad that came third in the Junior world championship this year. On the same weekend as the Pro14 kicks off, FS Cheetahs play the Sharks and the EP Kings play the wonderfully-named Windhoek Draught Welwitschias in the Currie Cup. Are you concerned about splitting the player pool between two competitions? As you know the process and talks regarding the Cheetahs decision to give up their contracts in Super Rugby and to join the Pro14 has been going on behind the scenes for quite some time. During this period part of the process and decision making by the Cheetah management was to ensure that we will have enough players contracted to be highly competitive in both competitions. From the cancellation of our Super Rugby contracts and the conclusion of new contracts for Pro14 the Cheetahs received additional funds (as well as support from our sponsors) that made it possible to build up a sufficient pool of players. We are the current holders of the Currie Cup and strongly believe that we are going to defend our crown successfully. We are definitely also going to be a big threat to be the first holders of the Pro14 trophy! It is a concern. I have emailed the Southern Kings on a weekly basis to find news on the squads and what they plan on doing. The EP Kings have 17 players in the squad plus the Southern Kings players. What I think they will do week by week is have their main squad for Pro14 games then the players left over will go and play in the Currie Cup. It gives players game time so they won’t be rusting waiting for players ahead of them to get injured and they can be called upon when needed. Probably similar to what the Welsh regions do when they have players playing for the clubs within the region. Last but certainly not least - do you feel this new competition will benefit rugby in your team's area? It has already benefited us in so far that players who considered moving to other franchises and abroad decided to stick and sign with the Cheetahs due to our participation in the European based Pro14. It is a well known that the Free State Cheetahs are one of the major breeding grounds of excellent rugby players that are grabbed up by other franchises as well as clubs abroad. Players are very excited to get the exposure in Europe that the Cheetah franchise are now offering to them and that promises to bring the best out of them to the benefit of the Cheetahs, Pro14 competition as well as the enjoyment of spectators. We are a rugby loving nation and there is already a lot of excitement amongst rugby supporters from all over the country to see the players from the prestigious clubs (that includes many of the members of this year's successful British & Irish Lions team to NZ) in action in SA. We are looking forward to the opportunity to contribute and to be part of such a great competition! It’s hard to say. Going back to the last question, it may result in EP kings signing new players which means more players will gain more experience they may not have had. As this is an experiment by SARU to "explore alternative playing opportunities in other international competitions" only time will tell what it can do for Southern Kings, EP Kings, Local rugby teams, Port Elizabeth and SARU as a whole. Now having a 15-16 months long season will be a strain on the players with only 6 weeks between Super Rugby finishing and Pro14 starting. Now I admit I know nothing about marketing and promoting a product but with 2 teams now playing in a European competition as well as the Super Rugby teams, I’m hoping it means European Businesses will take some more notice of South Africa and its potential on and off the field.